Ridge Runner Alaskan ULU Knife with Hardwood Stand | BUDK.com - Knives & Swords At The Lowest Prices! 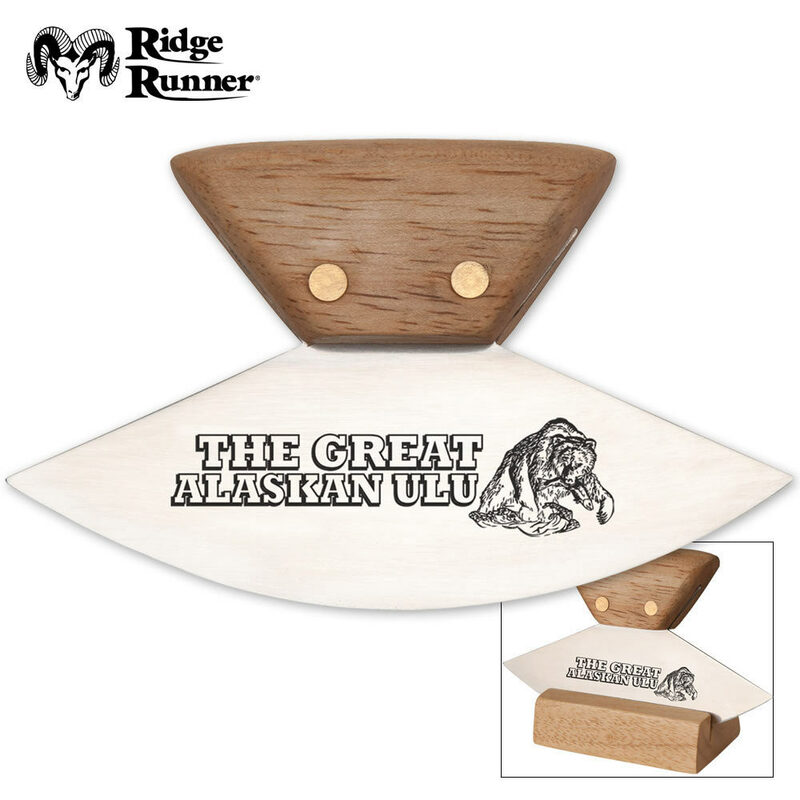 Cut fruit and vegetables and even fillet fish with this Ridge Runner Alaskan Ulu Knife! It features a razor sharp stainless steel blade and a handsome, genuine oak handle with brass rivets. It also includes a hardwood stand for storage or display. This is smaller than I thought it would be. It's small to handle deftly, and the handle isn't shaped very well for use. Consequently, it's been relegated to a drawer and I continue to go with a chef's knife or paring knife. I've seen larger ones available, so I may try one of those. But for $5.99, I guess it's about what you might expect. A bit small for my hands but still a great tool for cutting small vegetables like garlic, scallions, etc. need to find me one that will fit my hand better but I am still happy with this small one anyway. they are small and sharp too , I have the bigger ones too, But these are great for the price and are great for cutting the fruit and fish open and cleaning them far butter than the bigger ones. more controlable in your hand to, I use them for all types of food and they work very well thank. I bought one of these a year ago or so and have been very pleased with it. I lost the use of my right hand and find it very hard to cut up meat and it works great. Mine is razor sharp and well made. I liked it well enough that I just ordered another one. My only complaint is that it is hard to take it with you when going out, would love to have a sheath for it. Not that good it is very small. However the price was not high so for the cost you get what you pay for. I have a good ulu from Alaska and it is much larger and better but I paid much more for it. This does not reflect on CH kadels they are a great place to get cool things and I will surely be shopping there again as I have in the past. It was very tiny. I almost thought they forgot to put it in my order put then I found the tiny little box. Very cheaply made. Very small. I don't know how they put the edge on the blade but it has marks like the edge was cut with metal shears. I have a real Ulu I bought from an Eskimo in Alaska years ago, this one does not hold a flame to the real one.